1. Why would you spend money on activities that could have negative life consequences? 2. Why would you spend money on a vacation only to have incomplete or clouded memories of it? Question #1 identifies the “I’m invincible” mindset. The thesis here states that even though bad things are happening in the world, none of that will come home to rest on us. We fail to see any negative consequences coming from our behavior and believe that nothing will do us harm. Question #2 relates to the “Live it up now” mindset. Eat, drink and be merry for tomorrow we die. Memories don’t matter as long as I’m gratifying my pleasures in the moment. I can’t recall ever believing in the “Live it up now for tomorrow we die” philosophy. I attribute that to my faith but also from being raised by parents who never exhibited that attitude. Both kept me away from solely focusing on the moment. In regards to negative life consequences from our behavior though…well, haven’t we all been there at some point. We have all faced dilemmas where our body wants something but our heart knows it’s wrong. In those moments, our mind must decide which path to take. Often our choice is an incorrect one and we then face the emotional and physical consequences that come from the decision. Those decisions are compounded even more so with error when not made in one’s right mind. As difficult as it is to make a wise choice, why intentionally put yourself in a position that will require such a choice? I don’t know how much the average spring break trip costs. It would seem reasonable that with transportation, hotel accommodations, food and entertainment for the week, a person is looking at between $500-$1,000 minimum, depending on the destination. Maybe you could get by with less than that with some great budgeting or special packages. I’m not here to judge anyone’s actions in the present or the past. We are individually accountable for the decisions we make. I’m simply asking the question: “considering the consequences that could come, will a crazy spring break trip be worth it?” If it were up to me, I’d rather be able to relive the memories of my trip and experience no pain or suffering because of what I had done. Anything less than that, I would consider an undisciplined waste of money. 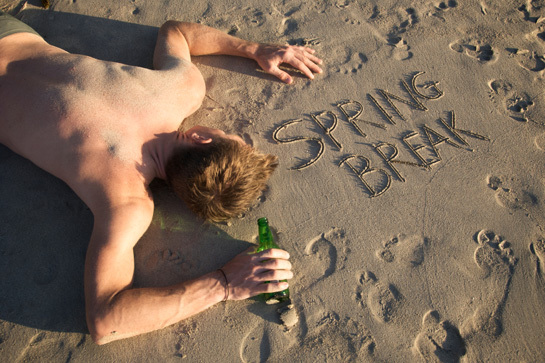 What spring break trips did you take in high school or college? How much did you spend? Were the spring break activities out of hand or pass without incident? Did you ever regret anything or did you experience negative consequences from an activity? What do you do when your body wants what your heart knows is wrong? I actually didn’t take an spring break trips in either high school or college that are noteworthy. I think one time we went on a road trip but it only lasted a couple of days and cost us less than $100. I didn’t really see travel as an option for myself in college or high school, regardless of whether it was a spring break trip or otherwise. I guess that saved me a lot of money. I think it would have been nice to go on one spring break trip, because I think that the memories would be great, but it’s definitely generally a waste of money. The three trips I took were fun and didn’t cost much. The best part though was that I stayed out of trouble. Can we call it a gloriously undisciplined waste of money? I think that’s what mine always were (Mexico and Vegas, since they were close to Phoenix). I enjoyed them immensely, and to be honest, the $300 or so I spent I had earned during the year, as I always worked through out college. I could have put it to better use (can’t that typically be said about most expenditures, though? ), but I do cherish the memories. I’d say you did well to only spend $300. I would have anticipated it costing more than that. I think my spring break experiences were almost always PG haha. I’m not really a party person so I prefer to do some outdoor sports activities instead. Interesting how most all of the PF people had little or nothing to do with the spring break stuff!!! I did my fair share of stupid things when I was young, but those spring break vacas always scared the crap out of me, watching all of the amazingly stupid things kids did and then recounting them as fun. Like Stefanie said, I never understood why parents would say “yes” to that type of a trip for high schoolers. I just hope our kids grow up with a huge amount of common sense and wisdom and don’t waste their time, money and many other more important things on being trashed for a week straight and partying with strangers. I’m not sure of the reasons either. Maybe it’s because they did similar things when that age…they want their kids to experience life…they don’t want to be seen as controlling…they don’t care….It’s definitely a head scratcher. Kids will mostly follow the parent’s value structure. If the parent’s believe it/do it, so will the kids. It’s all about parents modelling the right behaviors. Quite frankly, I think it’s insane that parents let high schoolers travel on their own to notoriously party-riffic destinations for a week. I spent spring break traveling with my family which was indulgent, but in a very different way. It does seem to be a very hands-off approach to parenting and a bit irresponsible. I actually never really went on spring break trips for exactly the reasons you mention, plus I typically used that time to work and save money to keep myself out of debt during college. But I have a number of friends who participated in this rite of passage, and every last one of them felt like the experienced was over-hyped before it started. It would be wonderful if kids could learn this without wasting the money first. That’s interesting Shannon…sounds like the experience didn’t live up to what they expected. That’s great marketing though…get people jazzed up to come spend their money. I went to college in a big city on the East coast, so my spring breaks were always spent traveling back to the Rocky Mountains to ski, snowshoe, and do other fun stuff with my family! Not exactly MTV material 😉 But very fun and fulfilling! Yes…MTV’s not showing up to see people in snowsuits. 🙂 I have on our family list of to-dos a trip to the Rocky Mts. We live in the South and I can’t wait for my kids to see what real mountains are like. I never had a traditional spring break – but I did Alternative Spring Break, where a group of us traveled to volunteer at a location for the week of spring break. That’s awesome Mrs. Pop! I’d like to push my kids in that direction. Helping others always produces valuable results…for those served and for those serving. Spring break as a kid wasn’t a very big deal. Maybe a short family trip or skiing. I definitely enjoyed the time off from school, but I didn’t view the same way spring break is viewed in college. I did enjoy spring break in college and there were definitely people who took it too far. Like you said, it’s that expectation it’s supposed to be wild and crazy, so some people have to make sure it really is! To me, there isn’t anything wrong with having fun but don’t do anything that compromises your values, and don’t pay for it with your student loan money. Earn the money to go (heck, that will also probably keep you more responsible too). I don’t think it’s helped that media outlets like MTV have helped promote the craziness over the years by broadcasting from the beach parties. I remember watching some of those years ago and feeling like I was missing out. I’ve realized now that I wasn’t. I went on spring break twice. Once was super PG to visit a boyfriends brother in California. It was my first time to the west coast so the expense was well worth it. My second trip was Miami spring break. NEVER GO TO MIAMI DURING SPRING BREAK! I represent the YOLO generation to the fullest, however my definition is living my once financially free.. not getting completely shwasty pants naked on the beach and hooking up with strangers! Thankfully I went with my boyfriend so we escaped the madness and had fun doing decent clothed activities like jet skiing. It’s a commercial hype of it all to get kids to act out, travel and spend money! This comment is getting +1’d for it’s awesome content and because I learned a new term “shwasty.” LOL…Thanks for the comment Taylor! HAHAHA… that’s what watching Jersey Shore will do to you! They should write a dictionary. You are going a great thing by educating your younger sister. I agree with your assessment that many college age young people are oblivious to repercussions. Or if they know simply don’t care. I guess I’m an oddball as I’ve never been on a spring break trip. My parents couldn’t afford to go on any vacations when I was growing up. Most people I knew went to Disney or on a cruise. Then again, I never hung out with party people! Disney is a pretty safe destination. Cruise is a little more party festive but regulated as people aren’t allowed to do whatever they want. There are rules of conduct on a cruise that ignoring could land you in trouble. I’ve never had a spring break trip, but during my undergrad days I sure wanted to. I see the appeal. It’s a party, you know? At that age, I wasn’t wise…heck, hardly anyone is that wise at 19. I made a ton of foolish decisions and, if I had the means to pay for a trip, I’d gladly have made some more in Cabo. I’d like to know the ratio of people over 25 that go on these spring break trips. I pick 25 because that’s the age at which science is now telling us the human brain becomes fully developed. I tend to think of those crazy spring break trips as being fabricated by the media, or at least making them seem more prevalent than they are. This post is actually the first I’ve ever heard of this type of trip being taken during HS! When I was in HS we had sports practice all through spring break and a tournament at the end, so traveling was not an option. In college, I really don’t remember anyone taking a big group trip. (Then again, I went to college in SoCal, so you can just drive to the beach.) I flew to meet a boyfriend’s parents one year and went camping for a few days with friends another – both pretty inexpensive. The biggest trip I remember any classmates going on was a service trip for Katrina cleanup. I’d much rather think of the trips depicted in movies and such as fabrications because they seem awful! I would say they are definitely more geared towards college age students. Most high school students won’t have access to these parties due to age. But some high school students still get in trouble as we’ve increasingly heard in the news media the last decade…Natalee Holloway was on her HS trip to Aruba when she got in with the wrong crowd in a nightclub I believe. “I remember spring break with clarity” good for you! I sometimes see the spring breakers in Cancún when I go catch a flight to Europe and they are pretty sad to watch, all drunk and behaving like idiots. If that is what they call having the time of their lives when they won’t remember it on the next day, I’ll pass. I love parties but nothing about that level of excess appeals to me. I was never allowed to go on any crazy trips. We normally just stayed put and hung out. I never really cared that much either. Now, I would kill for a week of spring break from work! Just to stay home, relax and spring clean. “…spring clean…” Yes…that is what I will be doing on our kid’s spring break next week. I had one trip to see my family in San Antonio when I was 16 (very tame and boring) and one my senior year that was part of a senior trip to the bahamas, which was part of my graduation present and I don’t remember how much it cost. It was out of hand for a lot of people, but at least there were chaperones. My roommates all drank 150 proof rum and were beyond sick, but I never drank much…always been like that. If I had a kid I’d be so scared to send them off with friends for spring break because my friends did crazy things. Chaperones provide some level of supervision but kids will always find a way around it. Our school does senior trips and they have gone off without any big conflicts. That’s mostly because we have small classes, provide multiple chaperones and the activities are scheduled in advance. Spring break was always crazy for me. I did some stuff that I am not proud of, but I did learn some valuable lessons. I will say that I find them to be a waste of money now, but that could only be related to what I did. “…valuable lessons…” That’s encouraging that some positives came from whatever you experienced. Well, certainly as a Christian these sorts of environments are/would be challenging, especially depending who you go with. I did not go on a traditional ‘Spring Break’ in college, but my wife went on and led a couple service trips. If I was going to do anything I would have done something along those lines. I admit my faith was a big aspect in me never going. The environment simply didn’t seem to fit with who I was. My parents always took us on a family trip for spring break, so I never got to experience the wild and crazy high school or college spring break experience. That’s probably a good thing! I think parents should be more involved in these decisions…even into the college years and especially if they are helping to fund them. I’d certainly want to know what my children were getting involved with.